@luin @BridgeAR tagging you both in. @Salakar nice! But the optimization for big chunks is gone. Yepp. If a bulk reply is bigger than the current chunk cache all following chunks until the bulk reply is complete and concat all cached chunks. I suspect that the simple string parsing speed will be about the same as the "new" parser because IIRC most of the time is spent converting Buffers to strings, and there is not much that can be done about that outside of node core. I removed the try-catch from the hiredis js interface since hiredis could be modified to not throw also, so removing the try-catch makes things more realistic IMHO when comparing benchmark results. This removal is reflected in the results above. I found a bug with startBigBuffer. It is appending lorem which causes all of the parsers to fail (due to incorrect string length). Removing the + lorem at the end fixes this. @Salakar I actually pulled from the v.2.0 branch, so the "new" parser is the one from #3 as of this writing. I will post the code once it is feature complete and once I'm happy with the optimizations.... I will try to work on it this week. I have not worked on array, error, or null implementations at all yet. then got derailed when I tested with 2^64 - 1.
either the numeric value of n if no overflow, or the string concatenation of n and m otherwise. chasing that glitch. Never did figure out how to avoid it. @andrasq that's an interesting way of doing that, incredibly performant, the benchmarks look identical to what @mscdex showed - so I assume he did similar. Didn't think about using SMIs, learn something new everyday! There were two unused vars v and suffix, removing those ups it by 2mil ops/s here. whoops, the v and suffix were left over from experiments. If you create a separate instance of the parser to parse the large int it still affects the other parsers integer parsing performance also so doesn't seem like it's the parser buffer or offsets etc. Still not bad though. Good work that you're doing! qtimeit is a node port of my php tool that I used for years before I started coding node. 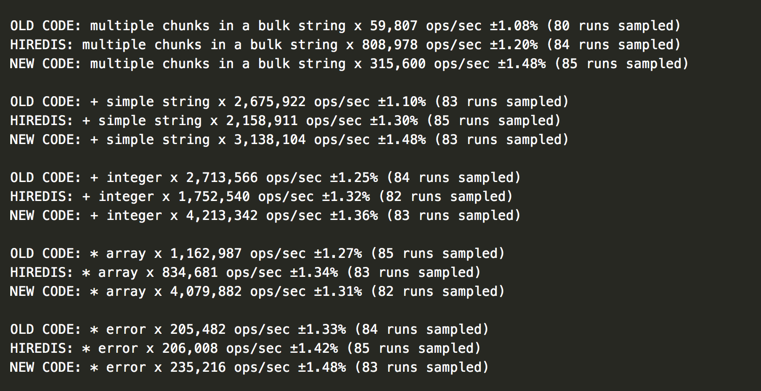 I write lots of micro benchmarks, and qtimeit is great for one-liners. more the state of the system. @andrasq true, I guess I was thinking that lots of buffers being parsed to .execute() was not helping gc, it's been a long day hah. The lower benchmark is still impressive anyway. Got any tips on how I could improve the buffer caching / chunking? Would some kind of setup with a stream be more efficient? As you can see in the improvement log above the ops/s on 4mb strings/buffers is quite low, which understandably due to the size would be slower. package qbuffers to coalesce and re-split buffers for a beanstalkd driver, might find ideas in there. the handling of char fragments split by buffer boundaries. just by avoiding the Buffer.concat.